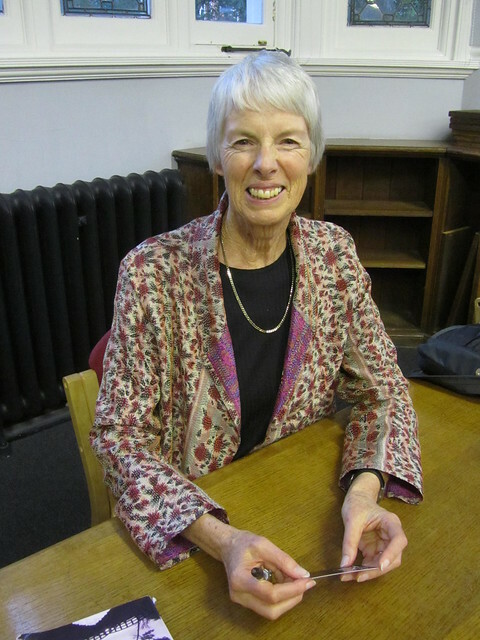 Earlier this month I attended a talk by author Lian Hearn, whose real name is Gillian Rubenstein. The talk was organised by the Japan Society and held at the Mayfair Library, and it was free to attend. The talk was mainly about Lian Hearn’s latest book, Blossoms and Shadows (read my review here), but also about how Gillian became interested in Japan, and where her pen name comes from. She said she had been fascinated with Japan since childhood and added, “It’s my destiny to write about Japan. I just have to submit to it.” One of the first Japanese words Gillian learnt was ‘Hiroshima’, having been born during World War II in 1942, and she later went on to study modern languages at Oxford University (although she says her Japanese reading ability is much better than her speaking). When she was about 16 or 17, Gillian was studying French and came across the film Hiroshima mon amour. Recalling the film, Gillian quotes a line, “If I paid attention, I would understand“, which is something she has applied to her study of Japanese culture ever since. Gillian, who emigrated to Australia in 1973, is better known as a children’s author, under her real name (see gillianrubinstein.com), but when she published the first of her Tales of the Otori series, Across the Nightingale Floor, she wanted to have the book judged under its own merits and not against her previous works, so she created the pen name ‘Lian Hearn’. The name takes ‘Lian’ from ‘Gillian’ and ‘Hearn’ for a couple of reasons – in honour of Lafcadio Hearn, an Irish writer who lived in Japan at the end of the 19th century, because ‘hearn’ is the old English name for ‘heron’ (which are a prominent theme in the Tales of the Otori series), and because ‘H’ has a good place on the bookshelves of most book shops. Gillian revealed that she is working on a new book, which is not going to be a sequel to Blossoms and Shadows, but she didn’t reveal many details about the book, other than that it would feature an explorer. If you haven’t read any of Lian Hearn’s books I would highly recommend starting with Across the Nightingale Floor, the first of the Tales of the Otori series. The whole series is truly magical, and some of the best books I have ever read. There have been rumours for a while that Across the Nightingale Floor is going to be turned into a movie, but not much has been revealed yet. According to lianhearn.com, the film rights were sold to Universal Studios before the first book was published, and David Henry Hwang was assigned as script writer. I’ve heard elsewhere that Across the Nightingale Floor might be released in 2014, but I don’t know if that’s true. I just hope they do the books justice when they make the films! Oh no, so mad I missed this. I love the Otori books. Still need to read Blossoms and Shadows though. Can’t wait! It wasn’t that well publicised I guess – shame you missed it! Blossoms and Shadows is very different to the Tales of the Otori series, but still really good! I’ve just started Grass For His Pillow, and bought my friend Blossoms and Shadows for her birthday, having heard about Lian Hearn through your blog. I’m trying to pace myself through the Otori books as I enjoyed the first one so much. That’s wise – I totally rushed reading the Otori books because I couldn’t get enough and then I was gutted when they were over.